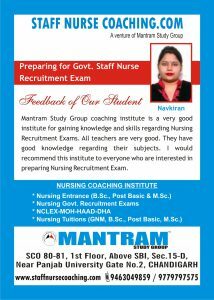 Mantram Study Group coaching institute is a very good institute for gaining knowledge and skills regarding Nursing Recruitment Exams. All teachers are very good. They have good knowledge regarding their subjects. I would recommend this institute to everyone who are interested in preparing Nursing Recruitment Exam. Mantram Nursing Academy welcomes you. You may contact our nursing coordinator on +91-9779797575 for any query.